CASA DEL SOL! 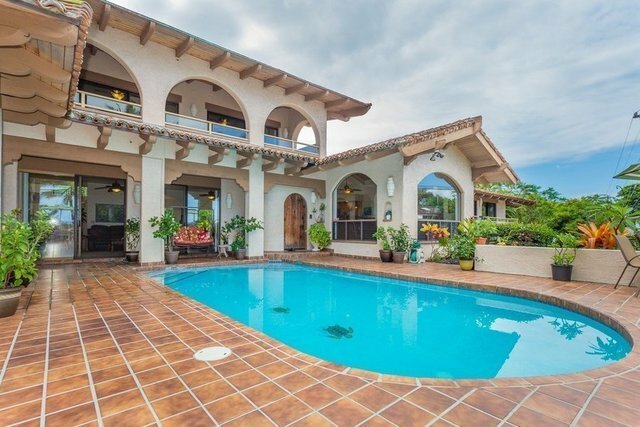 CUSTOM VILLA DIRECTLY ACROSS FROM THE OCEAN AND SURFING! FABULOUS POOL OVER LOOKING THE SURF! An extraordinary fully furnished custom villa residence awaits you, as you enter through one of two gates, into your own sanctuary of beauty with amazing ocean views! This home captures the spectacular Lyman's Bay for surfing and a beautiful coastline with unbelievable sunsets from almost every room! The expansive gourmet kitchen is just steps away from the fabulous pool and is laid with fine cabinetry and beautiful granite counter tops. The living area is open with lots of windows for wonderful lighting for viewing of the pool and surf just across the way! The entertainment/ pool table room is big and cheery and has it own wet bar area for additional entertaining. The master suite is stunningly over sized with commanding ocean views and a very large lanai, to step onto and take in the beauty of all around you. The two master bathrooms are spacious and beautifully appointed! In addition to two other lovely bedrooms, this home has two separate suites complete, each with a living room, a separate bedroom and each with their own kitchenette. Both with separate entrances as well! This wonderful Villa Estate has it all and would make a wonderful vacation rental, a corporate retreat, a primary residence or second home. The location is ideal and the ocean views are breathtaking. Even a 3-car garage! Come see this fabulous almost oceanfront estate for yourself!